Doesn’t that sound awesome? A tough heroine fighting the forces of censorship! It could still become awesome, but the first volume trades in some plot devices that put it at a distinct disadvantage, at least with me. Kasahara, a young trainee in the Library Forces, has decided to join that august body in part because one of its members “stepped in to protect her favorite book from being confiscated in a bookstore when she was younger.” That’s still not problematic, as there’s nothing wrong with pursuing a career because of the inspiration of someone you admire. Unfortunately, Kasahara refers to that mysterious figure as a “prince” and layers dippy, ill-conceived romantic notions on her otherwise totally admirable ambition. Maybe future volumes will focus less on dumb mooning and more on information specialists promoting the free exchange of information and ideas by any means necessary. 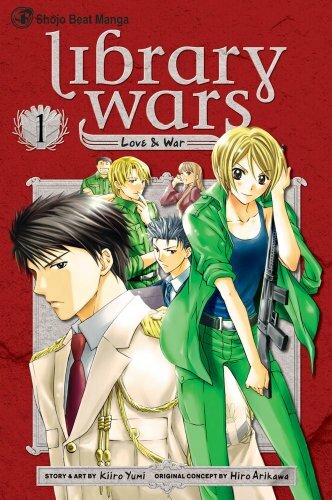 I’ll give Library Wars another volume, but Kasahara needs to get her dopey act together. Good intentions only go so far. Doesn’t that sound just too generic for words? It’s not, largely because high school beauty Sakura is actually quirky, and she’s tougher and smarter than Kasahara by a wide margin. All of the boys in Sakura’s school view her as a delicate flower they’d love to protect, in spite of the fact that she’s better versed in the martial arts than all of them combined. She’s too busy thinking about things that matter to be offended by their condescending entreaties, which makes for some pretty funny moments. One of the things that matter, at least in Sakura’s considered opinion, is an apparent mass murder that she witnesses while riding the bus home from school. She goes to investigate, but there’s no evidence. When a new boy, Rei, shows up in class, she recognizes him from the massacre and looks into the mystery, putting herself in danger in the process. Sakura’s tough, principled approach to life pretty much carries the book. She never cringes, and she has a really firm grasp on right and wrong. Rei’s vigilantism offends her notions of order and justice, and I’m looking forward to seeing their philosophical back-and-forth. 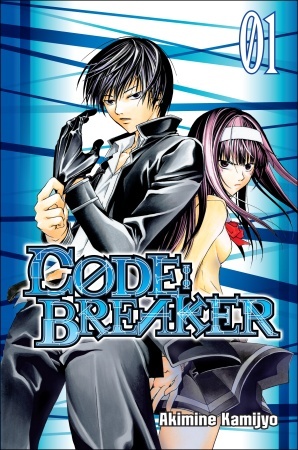 Code:Breaker could become as bland as its premise suggests, as much more promising manga has gone off the rails by the second volume, but I think I’ll enjoy this one as long as Sakura’s spine endures. This entry was posted on Thursday, July 15th, 2010 at 9:14 am and is filed under Del Rey, Quick Comic Comments, Viz. You can follow any responses to this entry through the RSS 2.0 feed. Both comments and pings are currently closed. I agree, I hate mangas where the girl falls madly in love with a character they have met like when they were 5 or something. I find it so stupid and so unrealistic, if not shallow (because the guy is always good looking >> ). That’s why these days, I’m very picky with my manga, especially when it dips into the romance part. I much prefer it when a character gradually falls in love with someone he or she initially hates. That should mitigate my dislike of Library Wars, since there’s some of that going on simultaneously, but it just means that Kasahara gets to be stupid and right at the same time. And, of course, the person she met when she was however-many years old magically finds his way to her again – only this time, they’re forced to be together for a long, long time, because at least one of them doesn’t recognize the other or remember his/her name. Let’s just say I totally disagree with you on Library Wars. The plot device doesn’t bother me at all. I thinks it’s one of the best manga to be published this year or any year. I hope you try v.2 and it improves for you. As for me, it was everything I hoped and more. V. 2 can’t come out fast enough. Okay, I have not read LW vol. 1 yet. I have it on order, but I really looked forward to this series since watching the first few anime episodes. In the anime it was presented that Kasahara was just beginning High school when the Library officer protected her, that chivalist act inspired her. I can attest that having someone step forward and protect you from bullies will send you into crush mode for that knight in shining armor or having a great respect for them for the rest of your life. In the anime Kasahara does grow in her skills and I truely hope the manga does the series justice. The frustrating thing about the Library Wars manga release is that from all that I’ve gathered, it’s the weakest incarnation of the series. I actually really enjoyed the anime, and have no idea why it hasn’t been licensed. The novel it’s based on is supposedly very popular and the best – and yet it’ll probably never get translated here. The “prince” theme is annoying, but in the anime it’s less so. The “prince” she admires more for moral and political reasons, and aspires to have the courage of her convictions that he does. But form what I flipped through of the manga, it’s as you say, she makes moon eyes over him. Frustrating!! Also, in the anime, you really see her giving her all at training to become a more skilled librarian, and I think that’s really positive for girls – especially since it’s in a military setting. And in the anime, Kasahara was virtually never sexed up, which I really really appreciated. The manga seems to have … exaggerated her characteristics a bit. I’m glad to see I wasn’t the only one whose reaction to Library Wars was “meh.” I wanted to love it — really, I did — but I felt that the author spent too much energy on the “prince from my past” silliness and not nearly enough on the backstory. I’m sorry David, but in your coverage of Library Wars, you explain your distaste for tropes which are made somewhat self-aware throughout the manga. Beyond your personal tastes and the book’s failure to cater to those tastes, you haven’t made an objective case for why the book doesn’t work though. Sorry the book isn’t LCIS? Best of the Best may work for one of Tom Clancy’s valentines to the testosterone-dominated military/industrial complex, but Kasahara’s goofy everyman putting in hard work to make up for her faults is wholly appropriate for the populist lean of the story. The mystery romance is certainly a silly angle for Kasahara, but the story makes its awareness of that known on top of contrasts drawn between Kasahara’s ideals and her job’s realities as she gains experience. Well, I was trying to make a case for why I didn’t enjoy it, and why the content didn’t precisely track with the marketing. Since this is a hobbyist blog, I don’t really see why I have to make any case beyond expressing a reaction based on my tastes.